Parties are fun. It’s a time to celebrate with friends and maybe cut loose a little. With games, food, drinks and other fun activities, parties can be a great time for all. Until you’re the hostess dealing with the mess the next morning. You may be faced with just a few paper plates that didn’t make it to the trash and a few popcorn kernels next to the couch. Or it could be an all-out disaster with crumbs everywhere, plates and cups completely missing the garbage can and furniture in places it shouldn’t be. The fun had at the party can quickly be forgotten with the aftermath of hours of cleaning. But cleaning up doesn’t have to crush your joy. With these six cleaning tips, your house or space can be back to normal in no time. If you’re hosting a party and have a feeling things might get a little messy, prepare for it. An article by Elizabeth Pullman from The Spruce says to close doors to rooms that you don’t want your guests to venture into. Pullman also recommends to have rags, paper towels and an all-purpose cleaner out and nearby. That way, when spills occur, you can be right there to wipe it up. Encourage your guests to throw away their trash by setting out garbage bins. Place one for recycling and another for trash. When guests know where to put their used plates and empty bottles, it’ll make your job much easier. When you’re setting up your area for the party, Pullman suggests keeping food and drinks in the same spot. When the potential spills and crumbs are contained in one location, cleaning up can be easier. Choosing to serve food that’s not overly messy can also cut down on the mess, notes Janine Boldrin from Good Housekeeping. For example, opt for mini quiches rather than plates of spaghetti. And, don’t be too tempted to do a major clean up during the party. Doing so makes guests uncomfortable, notes Boldrin. Instead, keep the clean-up minimal and discreet. When the party’s over, then you can go into full cleaning mode. One of the quickest ways you can start to see a difference in the cleanliness of your space is by throwing garbage away. This is the easiest way to get a noticeably cleaner room. Throw out used paper plates. Collect empty pop cans and bottles for recycling. If there’s leftover liquid in the cups or bottles, pour them out in the sink first before tossing to avoid a leaky garbage bag. Before too much time passes, be sure to address those spills. Doing so will help prevent stains and sticky surfaces. If you do see a stain, start pre-treating it right away. Pullman says to attack those stains with an all-purpose cleaner first, and if that doesn’t work, try things like baking soda and vinegar to get them gone. If you wait too long into your cleaning process to address those stains, they’ll set in more and make it even more difficult to get out. If your stains are on linens or other washable materials, pre-treat the stain before throwing them into the washing machine. Don’t let dirty dishes or leftover food sit out too long. Rinse off those dishes and either wash them by hand or load them into the dishwasher. Cork leftover wine and other drinks. Put leftover food in containers for later. If food that should have been refrigerated way earlier, just toss. Having leftover cheese or potato salad isn’t worth the risk of food poisoning. Once the food is put away and the spills and stains are cleaned, time to tackle the rest of the house. If you moved furniture around into those ‘off-limit’ rooms, return them to their rightful home. Pick up the pillows lying on the floor. Fold up the blankets slung over couches and chairs. Sometimes, you just don’t want to deal with a messy house the night of or day after a party. In such case, you can bring in a cleaning expert. Companies such as Your Bright Home Cleaning Service, who specialize in after party cleaning in Park Ridge IL, can help restore your home back to order without the time and effort of doing it yourself. Don’t be discouraged by a big mess after a fun evening. Cleaning up can also be a fun activity you can do alone or with your family. Race to see who can pick up the most cups. Stack as many paper plates as you can before tossing them in the garbage. 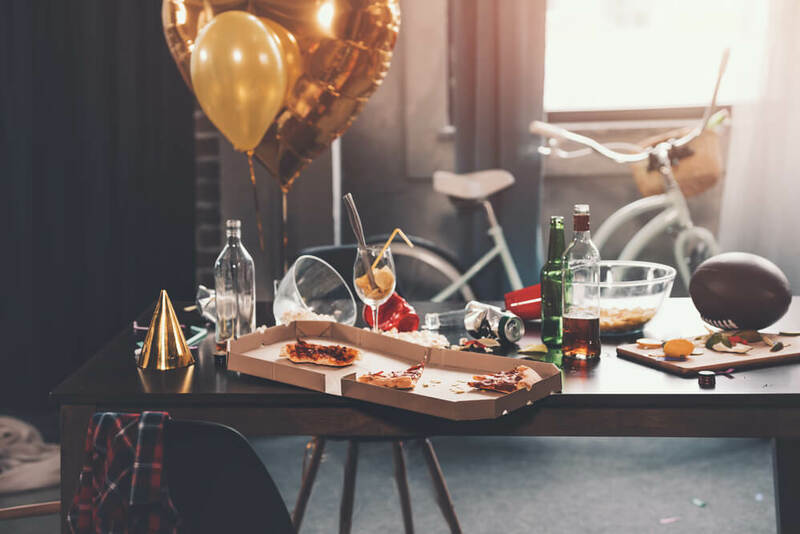 The aftermath of a party doesn’t need to prevent you from having a good time. Enjoy the event and know that you’ve got tips to clean efficiently when it’s done.